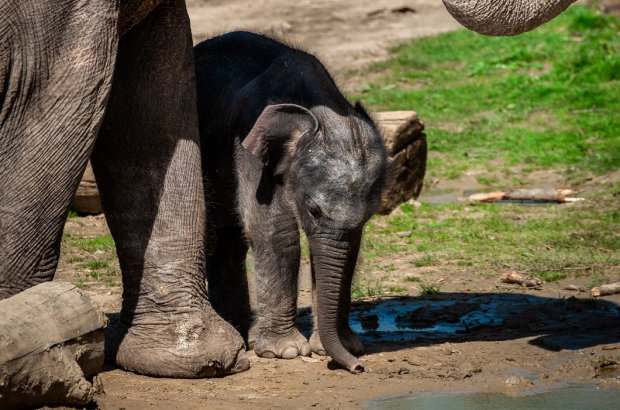 A third elephant over the course of just one month has died at Planckendael animal park in Mechelen. The death came as a surprise as Tarzen appeared to be doing well after the death of his mother at the end of May. Tarzen was born in April to elephant Phyo Phyo. Because of her weakened condition due to kidney problems, Tarzen’s health was quite fragile. He seemed to be turning a corner over the last couple of weeks, but died suddenly on Wednesday. Phyo Phyo died earlier this month of kidney failure, just a week after another of her offspring, Qiyo, died. Qiyo was two years old and died suddenly after seeming lethargic for a few days. An autopsy revealed that she died of elephant herpes, a virus to which young elephants are particularly vulnerable. Phy Pho’s other children include May Tagu and Kai-Mook, who also live at Planckendael. The death of the three Asian elephants is a blow to Europe’s breeding programme. Male elephants are sent to different animal parks as part of a programme to ensure the survival of the breed. The wild population of Asian elephants, found in India, Sri Lanka and Indonesia, are endangered. The latest announcement has been made just a few days after Planckendael came under fire for the shooting death of a lion that escaped from her enclosure. After trying to tranquilise the animal, staff and local police made the decision to shoot her to ensure the safety of visitors, not all of whom could be evacuated from the park. Very sad. Planckendael is not competent to manage wildlife. Wildlife belong in nature - set them free. Maybe it's time to fire everyone there ?